Being afraid of the dark did not come with Pappie’s death in 1984. I’d never been comfortable in the dark. I feared what I could not see. Growing up with my Ouma Chrissie and my Oupa Mike I slept next to my Ouma on a mattress on the floor. She would hold my hand until she fell asleep. It had nothing to do with poverty or lack of space. My Ouma had grown up in an orphanage and without meaning any harm, projected her need for comfort onto me. A co-dependant, very loving and caring relationship followed. She said the day I was born was the happiest day of her life. Imagine being loved so deeply. The passage light was always left on at night. Oupa Mike got up at 3am daily to leave to work on the mine. His former racing pigeon clock stood in the passage on the floor so he could see it from the bed. There was no alarm, but Oupa always left on time. 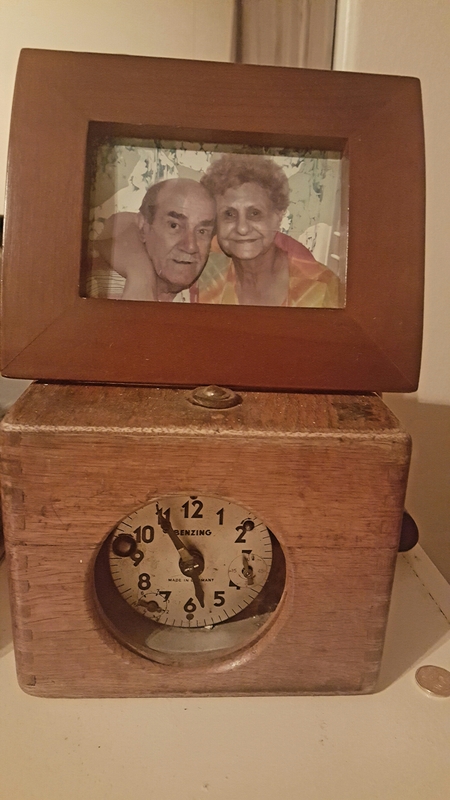 With pride I am the keeper of the much loved clock in my family. After Pappie died and I came to live with my Mammie and my sister in the city, the darkness held new fears. I was eleven years old. I desperately wanted to dream about Pappie, I didnt want to forget him, but was petrified he would appear to me at night. Like a ghost. I was scared my Mammie may die and I did not know how to reach my Grandparents. Life as I knew it, had changed forever. A lot of therapy and money later I now know that the feelings I experienced was quite normal for a child of my age. It was the first time in my life I had to sleep in my own room. My anxiety intensified. Every day held new experiences in the big city of gold. All I wanted was to go home! There was no return, so I had to cope and thrive …. and quickly. I didn’t tell anyone about my feelings. I didn’t want to be a problem. My Mammie was heartbroken over my Pappie’s death. It is only now as an adult that I realised she was only 30 years old at the time! They were so young. My sleeping habits didn’t improve. Instead of the banging door and counting the hours on Oupa’s clock, I now listened to the muffled sound of my Mammie crying. It was not a good time for anyone. I’m 43 years old now. My anxiety remains my most faithful companion, but I’m no longer afraid of the dark. The darkness is now a place to hide tears, a space I can think my thoughts without an audience. Somehow the dark holds a sacred silence… weird because the inner city life is alive at all hours. I don’t know why it changed exactly. I think it was when my Oupa Mike died, very peacefully of old age, almost a decade ago. Standing next to.his open grave, I clearly remember thinking, this was my worst day. If I can make it through that day, I can face any day, or night that followed. It is only now, when a lie awake in the dark of night while my mind wonders and visit the triumphs in my life, the dissapointments and often the self loathing for things I cannot forgive myself for, that I know the sun will rise again. The night is only so long. Previous Article I am richer for having you. Next Article Watch “In the Heart of the Sea” on @mnetmovies NOW!